The present Umfolozi Mill had its origins back in 1916 following a concession granted in 1913 to the St Lucia Sugar Company to mill sugar cane at Umfolozi. Two years after the inception of the mill, a devastating flood caused extensive damage to the factory and infrastructure and subsequently “went under” following the massive costs of reconstruction. As a result it was put up for auction in 1923 and was purchased by a small but enterprising group of farmers under the leadership of George Heaton Nicholls. Following another flood in 1925 it was decided to re-site the mill on higher ground – where it is presently situated. In the early 1930s it was decided to drain the lower Umfolozi flats thus making more silt rich land available. Periodically the flats were subjected to floods, some relatively mild but others, such as the 1963 flood, resulted in great damage, while the flood caused by Cyclone Demoina in 1984 was catastrophic. Some 1 800 hectares were lost to sand deposits. Over the years, a narrow gauge rail system has been developed to facilitate the extraction of cane from the flats in wet conditions, and today is probably the most cost effective cane transport system in South Africa. This transport system together with significant flood mitigation measures on the Umfolozi flats and coupled with the good cane growing conditions makes the Umfolozi mill area a highly productive sugarcane growing area. Over the years a number of offers to buy the mill or attempts at takeovers were made, but these were rejected until in late 1991 an offer was made by CG Smith Sugar Limited. After extensive negotiations the Board of Umfolozi Co-operative Sugar Planters Limited, under the Chairmanship of Ian Wiseman (the grandson of one of the original pioneers) decided to accept the offer made by CG Smith on 1st April 1992. The name of CG Smith Sugar Limited was later changed to Illovo Sugar Limited. 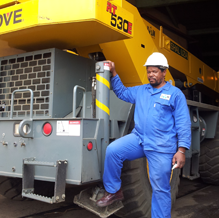 In 2005, a year after the acquisition of Gledhow Mill by the Sokhela Family Trust from Illovo Sugar Limited, Umfolozi Mill and associated properties (housing, etc) were also purchased by the Sokhela Family Trust under the name of Umvoti Transport (Pty) Ltd. Consequently, Gledhow and Umfolozi mills formed the Ushukela Milling Company which was the first BEE sugar company in South Africa. Due to various issues, Illovo Sugar Limited resumed ownership in 2008. 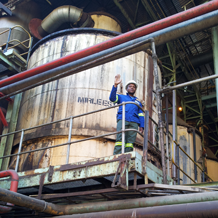 After lengthy negotiations, a consortium consisting of UCOSP Limited, UVS, Charl Senekal and NCP Alcohols was formed, and on 1st April 2009 the Mill formerly changed hands again, under the new name of the Umfolozi Sugar Mill (Pty) Ltd, affectionately called USM. There are effectively two shareholders, GrowerCo holding 76.87% (comprising 23.13% UCOSP Ltd, 23.13% UVS, 23.13% C.H. Senekal and 7.5% SSG all of which supply sugarcane to the mill) and the other 23.13% being held by NCP Alcohols who receives the molasses from the mill. Cane supply comprises 1 250 000 tons in a “normal” climatic season of which 65% is produced on the Umfolozi flats and delivered on the narrow gauge railway. The balance of cane is delivered by road and includes approximately 120 000 tons delivered by Small Scale Growers (SSG), who comprise numerous plots of approximately 1.5 hectares. 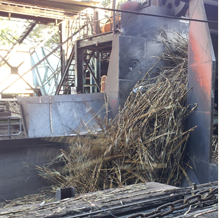 Potentially the mill is capable of crushing 1 500 000 tons of cane before significant modifications need to be made to the plant and there is every intention to grow the cane supply accordingly. The mill has a tippler system for the offloading of the trams and a spiller system for road deliveries. Cane is prepared by way of two cane knives and a shredder and extraction is carried by way of a DeSmet diffuser with three de-watering mills. Steam totaling 220 tons steam per hour is produced by three boilers and electricity is generated by two turbo alternator sets.